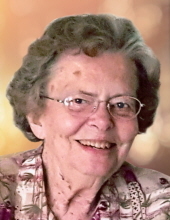 Freeport – Phyllis Lorraine Stykel, 83, of Freeport and formerly of German Valley, passed away Sunday, March 17, 2019 at Presence Saint Joseph Center in Freeport with her family by her side. She was born December 31, 1935 in Freeport the daughter of Benjamin and Tena (Miller) Hayunga. She graduated from Pleasant Prairie Academy in German Valley in 1953 and attended the University of Dubuque. Phyllis married Harm Stykel at the Silver Creek Reformed Church in German Valley on August 27, 1954 in a double wedding with her sister Anita Foelske. Phyllis farmed with her husband and was a teacher’s aide for Head Start in Freeport, the Forreston School District and St. Francis School for Exceptional Children. She was an active member of the Silver Creek Reformed Church where she had taught Sunday School. She enjoyed animals, baking and most enjoyed spending time with her grandchildren and great-grandchildren. Phyllis is lovingly survived by her sons, Ronald (Susan) Stykel of Colgate, WI, Darrell (Nonnie) Stykel of Freeport, Gary (Coreada Kelly) Stykel of Collinsville, IL; grandchildren, Eric Stykel of Lee’s Summit, MO, Ryan Stykel of Atlanta, GA, Samantha (Tyler) Stevenson of Middleton, WI; twin great-granddaughters, Elinor and Camille Stevenson; brothers-in-law, Marvin (Birdine) Stykel of German Valley, John Rust of Freeport; several nephews, nieces and cousins. Phyllis is predeceased by husband Harm Stykel; sister, Anita Foelske; sister-in-law, Elizabeth “Betty” Rust. Funeral service 11:00 a.m. with a visitation starting at 10:00 a.m. on Thursday, March 21, 2019, at Silver Creek Reformed Church, 326 S. Bunker Hill Rd., German Valley with Rev. Grant Mulder officiating. Interment at Silver Creek Cemetery in German Valley. In lieu of flowers a memorial will be established for Silver Creek Reformed Church. Arrangements by Genandt Funeral Home, 602 N. Elida St., Winnebago. For an online obituary and tributes go to www.genandtfuneralhome.com. 326 S. Bunker Hill Rd. "Email Address" would like to share the life celebration of Phyllis Lorraine Stykel. Click on the "link" to go to share a favorite memory or leave a condolence message for the family.